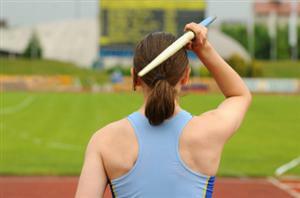 Take care to stand at a clear distance away from the trajectory of the javelin during the javelin throws. Javelins should be thrown only by experienced athletes. This experiment should be supervised by your physical education teacher. This science fair project was carried out to determine how the take-off angle of a javelin will affect the distance traveled. Testing was done by by having an athlete throw a javelin at various angles. The distance achieved in each throw was then determined. The javelin will travel the furthest when thrown at 45°. The javelin was originally used as a weapon of war. The javelin used in wars of long ago was heavier than the javelin used in athletic competitions of today. The javelins of old were originally made of wood. But modern day javelin re made of graphite or aluminum. Javelin throwing is one of the contested events in many major athletic events as well as in the Olympic games. The javelin used in the men’s athletic event weighs 800 grams and the ones used in the women’s event weighs only 600 grams. The objective of the javelin throwing event is to throw the javelin the furthest possible distance without committing a foul. To achieve this, the athlete must give a lot of consideration to the aerodynamics and biomechanical principles involved in javelin throwing. 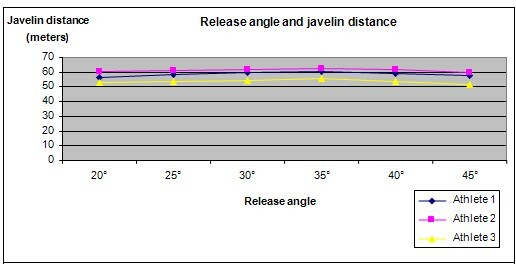 The three important factors that determine how far a javelin travels are the release speed, release angle and the throw height. The release speed is achieved by a combination of moves that involves the entire body. The release speed must also be combined with a correct release angle to achieve greater distances. The correct release angle will produce lift and minimize drag. Lastly, the throw height is determined by the height of the athlete. Thus, taller athletes tend to have an advantage when it comes to throw height! 1. For this science fair project, the independent variable is the javelin take-off angle, i.e. 20°, 25°, 30°, 35°, 40° and 45°. The dependent variable is the distance traveled by the javelin. This is determined by using a measuring tape to measure the distance traveled by the javelin after each throw. The constants (control variables) are the weight of the javelin and the strength of the athlete. 2. The 3 participants are made to perform some warm-up exercises before the recording of the javelin throws. At the same time, the cameraman will set up the video camera at a suitable and safe position where footage showing the angles of the javelin thrown can be captured. The assistant will help to measure the distance the javelin is thrown. 3. The participants attempt 5 throws each at 20°, 25°, 30°, 35°, 40° and 45° angles. However, it may be difficult to control the actual angle of release during a throw. Therefore, the throws made by the participants will be recorded and the distance of the throw closest to the required angle will be used. To avoid inaccurate results due to fatigue, the athletes should be made to rest between each set of 5 throws. 4. After all the participants have completed their 30 javelin throws and the results have been measured and recorded, the DVD disc will be played back to measure the actual angle of release. The distance achieved in each javelin throw for each required angle of release is recorded in the table given below. It is observed that the distance achieved for each javelin throw peaked at the release angle of 35°. This was true for all 3 athletes. The hypothesis that the javelin will travel the furthest when thrown at 45°is proven to be incorrect. Our results show that the optimal take-off angle is 35°. Javelin throwing is a very old athletic event. It was mentioned as early as the 8th century, in The Iliad, a literature piece written by Homer. Javelin throwing was also contested in the ancient Olympic games held in Greece. Currently, javelin throwing is one of the regular events contested in track and field events all over the world. In these events, participants use a 2.5 meter long javelin. The science fair project can also be repeated with a discus and shot putt. Try to repeat the experiment on athletes of different heights.